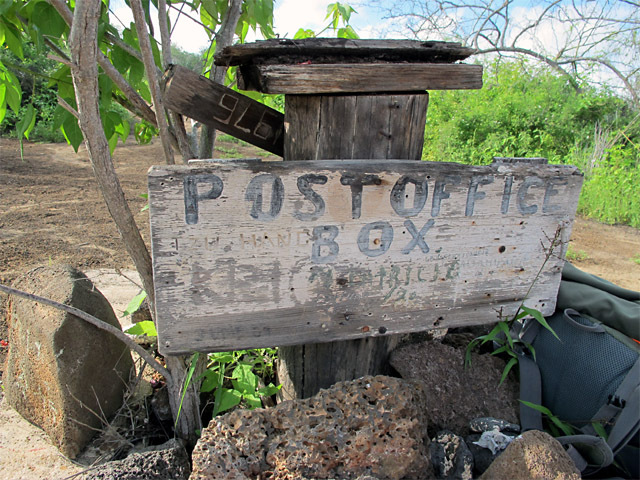 My lovely friends Brian and Katie took a long-awaited trip to the Galápagos Islands a few months back, and they were thrilled to pass on information about the, shall we say, informal 'Post Office' on Floreana Island. The Galápagos Islands (and the biota living thereupon) are among the most distinctive in the world, straddling the Equator across a span of a couple hundred miles. The archipelago constitutes a province of Ecuador and currently houses 25,000 residents. More significantly, the islands house native species not found anywhere else in the world, and the rich diversity of animal and plant life inspired Charles Darwin's development of the theories of natural selection and evolution. These islands changed our understanding of life as we know it. But I digress. 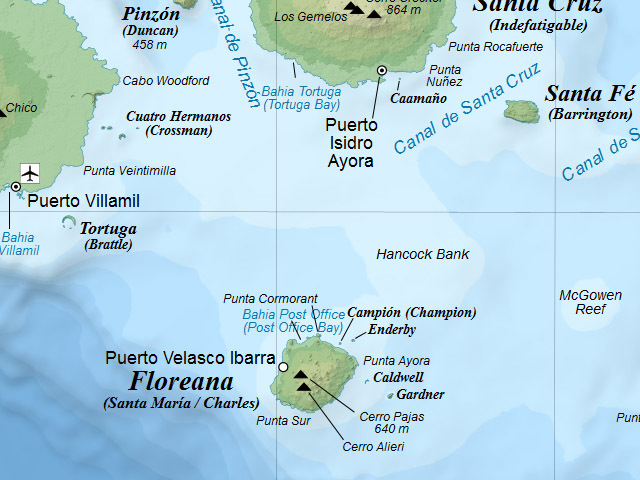 And here's a closer view of Floreana Island [bottom of map]note Post Office Bay! The Bahía Post Office on Floreana Island has been around since 1793. Back in the day the Galápagos were a stopping point for large whaling vessels. Now imagine: your home country is somewhere in Europe, and here you are in the middle of the Pacific Ocean off the coast of South America, half a world away (and the Panama Canal not to be built for another century). Your voyage is not just months but probably multiple years long. The people who invented the telegraph haven't been born yet. So how do you communicate with loved ones? This is one of the few visitor sites in Galapagos where human history is the main focus. A group of whalers placed a wooden barrel here in 1793 and called it a post office. Traveling seamen would leave addressed letters in the barrel and hope that the next seamen to come along might be headed in the direction of their letters’ destinations. Today, visitors leave their own postcards and sift through the current pile of cards—if they find one that they can hand-deliver, they take it with them. 1. To send a letter: you write a post card, do not put a stamp on it and put it in the mailbox. 2. To deliver a post card: You look through all the post cards in the mailbox and find one that goes somewhere near where you live. You take that post card home and drop it off at their house when you have time. I have no idea what is going on by the barrel. (Does that head-thing on the right remind anybody else of Donnie Darko??) Unfortunately it appears there has been some graffiti as well. That said, this is definitely unique and utterly cool! Bonus: Ecuador's postal service is called Correos del Ecuador and there are other, more traditional, post offices on the Galápagos Islands. Here are some descriptions. EcuadorExplorer.com: "The main drag, Charles Darwin, runs east-west along the bay. At the westernmost end of town you will find the Academy Bay port, the main grocery store, hardware store and post office." GoVisitGalapagos.com: There is only one bank in town with an ATM machine and the post office is right hear the harbor. Miami.edu: "Buildings are concrete block, often colorfully painted or sporting murals as on the post office below. As the postmistress is the mother of one of the town’s laundress, when the laundress is out of town, you can pick up your laundry at the post office." There's are photos of the post office here (fourth photo on the page) and here! Great photo here! 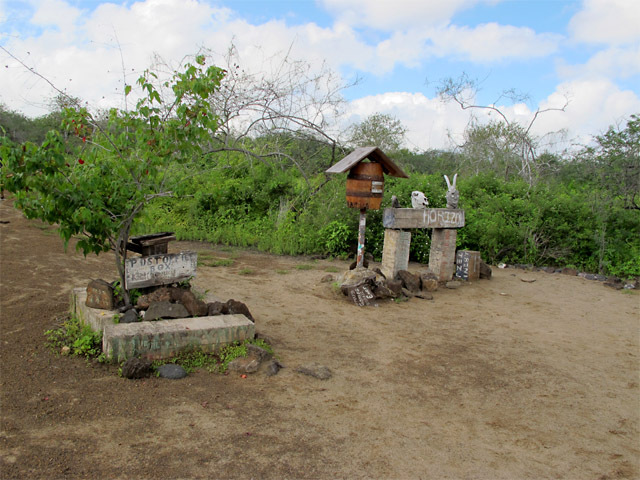 "There aren't many places where you can send or receive mail in the Galápagos islands, but on San Cristóbal the town of Puerto Baquerizo Moreno has a post office."